Dataedo 5.2 includes an option to customize PDF export. You can add your logo, change font styles and texts on a title page, footers and headers. 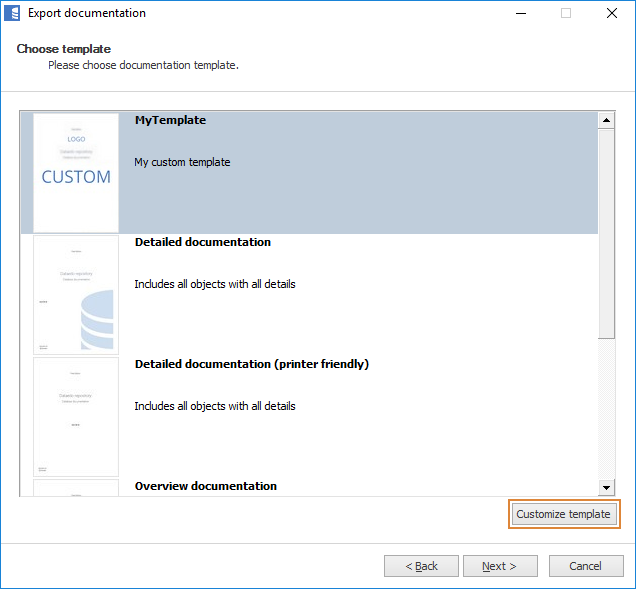 To customize PDF you need to create your own custom template. 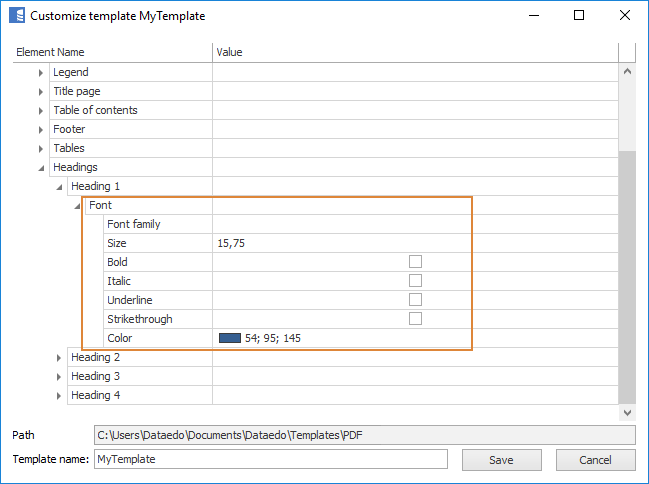 To do so, select existing PDF template in PDF export window as a base template and click Customize template button on the bottom. 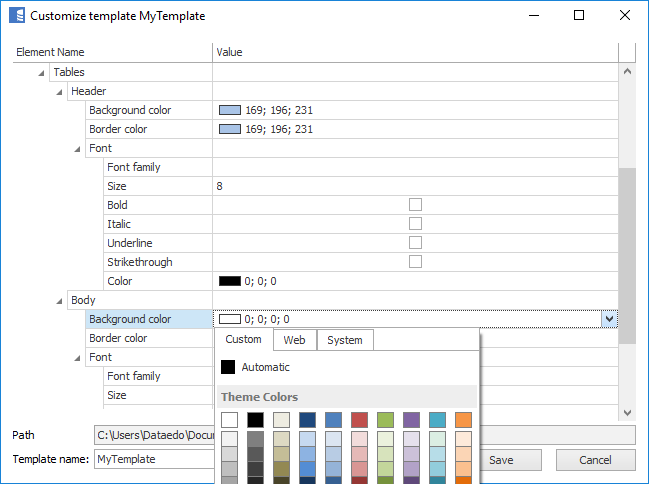 You will see Customize template screen, as below. 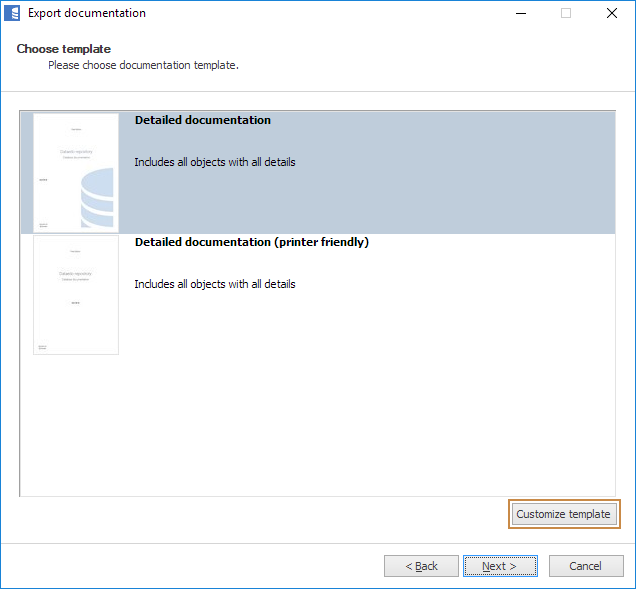 Template description - you can provide a description that will be displayed on templates list in the export window. Type and Subtype - read only fields defining your template. Customization tree - hierarchy of attributes to edit styles. Path - read only field showing the path where the template will be saved. Template name - provide a unique name of your new template. Click the save button to save your new template. 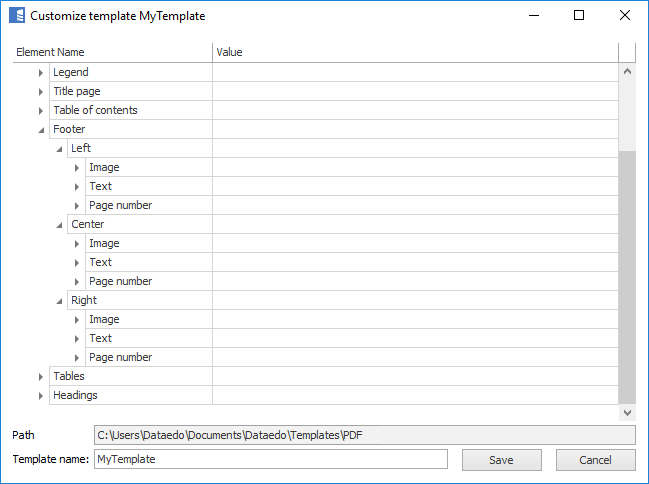 Custom templates are saved in your Windows Documents folder in \Dataedo\Templates\PDF subfolder. Each template has its own separate folder. Your new template is visible on the list of templates. It is distinguished with an icon with a "Custom" label. 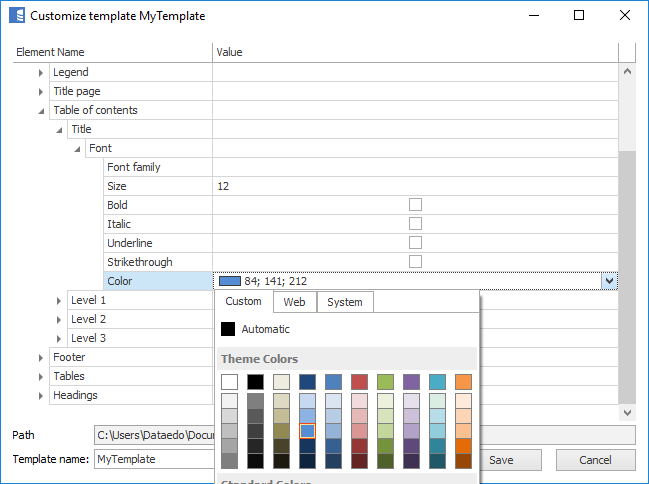 To edit your template, select it and click Customize template button on the bottom. You can customize the text of each field on the title page, add your own logo and add hyperlinks to each element. Title page elements are available under Customization > Title page tree. 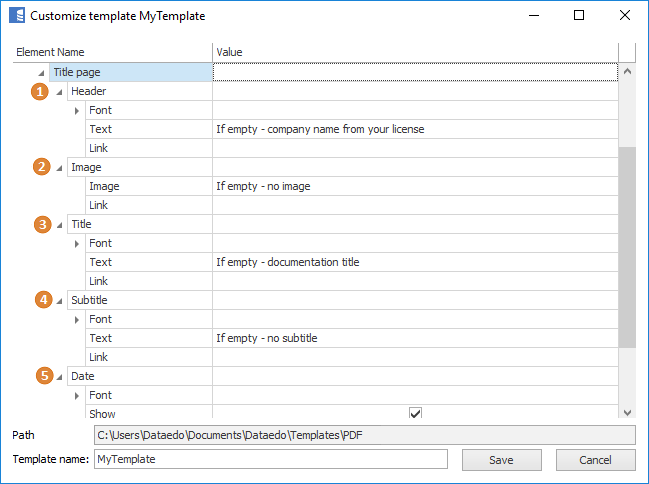 Header > Text - There will be a company name from the license visible if left blank. Provide text if you want to overrirde with fixed text. Enter space to remove text. Image > Link - Choose a file if you want to add a logo. Title > Text - Documentation title will be set if left blank. Enter fixed text to override. 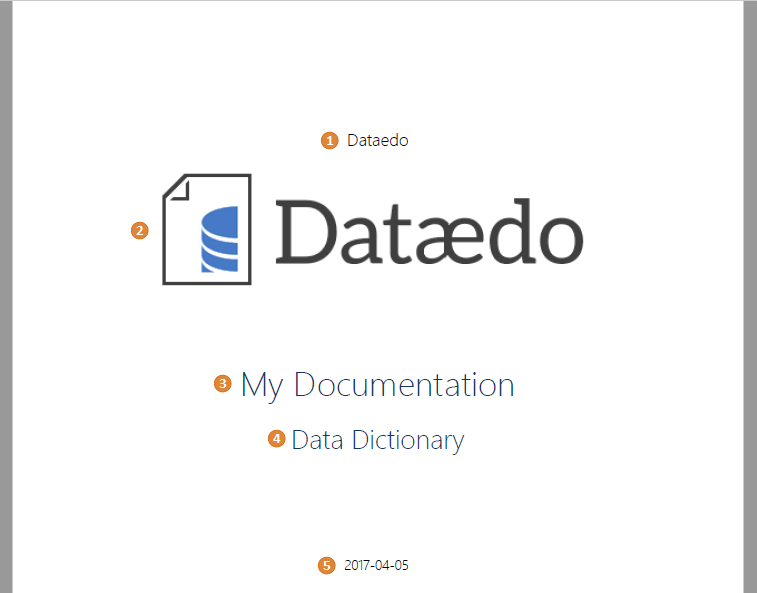 Subtitle > Text - By default "Data Dictionary" is hard coded in the template. Provide your own or set blank. Date > Show - Use checkbox to specify if date should be visible. Logo image should have up to 697 pixels width and up to 150 pixels height. If an image is bigger or smaller, it will be scaled while keeping proportions. To change the default font of the entire document, just choose one in Customization > General > Font family node. As long as you do not specify another for a specific part of the document, this font will be used. Note: Dataedo PDF export supports TrueType fonts only. Other fonts (e.g. Postscript) may not work properly. You can check whether a font has TrueType outlines by double clicking it in Fonts Windows menu. Note: This setting will not impact text from rich text fields - style in those fields are fixed within a text in an editor. You can set a font style in specific document element - you can customize font family, size, styles (bold, italic, underline, strikethrough). table background and border color for both headers and body. You can customize the look of tables containing details of your objects. Both the font style, border and background color can be set independently for headers and body of the table. By default, page footer contains only a page number in the bottom left corner. In your template, you can choose whether to display page number in the middle, on the left or not at all. Template's footer is divided into three sections - left, center and right. Each can contain page number, static text or an image. If a section includes both a text and an image, the text will be displayed over the image. Both image and text can have hyperlinks. Footer images can have up to 225 pixels width and up to 23 pixels height. If an image is bigger or smaller, it will be scaled while keeping proportions. 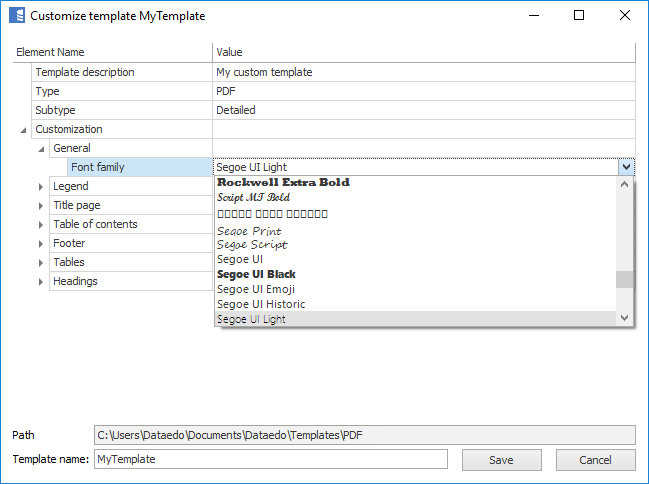 Custom templates are saved in %USERPROFILE%\Documents\Dataedo\Templates\PDF folder. Each new template will have its own folder. 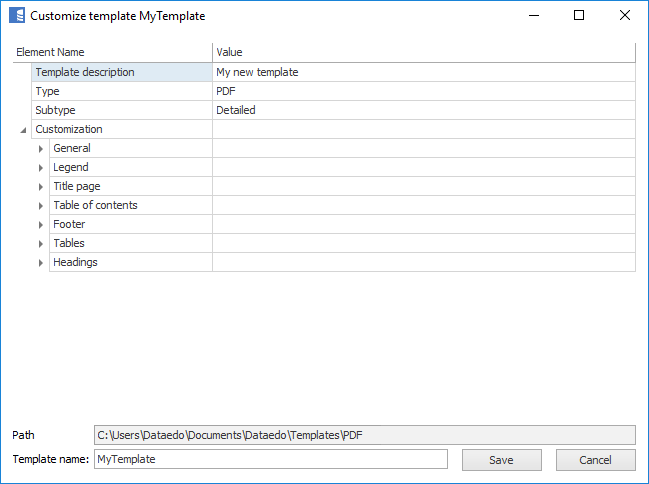 You can share your template with other users just by copying this folder to their corresponding %USERPROFILE%\Documents\Dataedo\Templates\PDF folder.